1. A system of religious worship, especially with reference to its rites and ceremonies. 2. An instance of veneration of a person, ideal, or thing. 3. A group or sect bound together by veneration of the same thing, person, ideal, etc. 4. A religion or sect considered to be false, unorthodox, or extremist, with members often living outside of conventional society under the direction of a charismatic leader. Does Christianity fit all that? I’m sure some folks would shout YES! Let me beg to differ. As far as I’m concerned “religion” is a set of behavioral rules designed to fit people into little slots and let others pass judgement on them. I would not be a follower of Jesus Christ if that’s what Christianity is about. It’s hardly a surprise to write that serious Christians venerate Jesus Christ, whom they consider to be the Son of God. Nor is it a shock to write that serious Christians are a group bound together by veneration of Christ. But by those definitions, “Beliebers” (fans of pop star Justin Bieber) could be labelled a “cult”, complete with all the onerous attributes that most of us associate with that term. So what happens when anyone leaves any group? Most of the time, it would be questioned, dissected and judged. Indeed, if it weren’t, then the members of the group clearly don’t care about the person leaving. Having a lighthouse to guide us through life’s nastiest emotional, financial and physical storms. Knowing that we are loved — loved so much that God offers all humanity the gift of His Son, whose sacrificial death makes up for all the wrong things we’ve done and all the right things we’ve failed to do. Having the assurance we will spend all of eternity in the intimate presence of our Creator. When someone leaves all that, should we shrug and walk away? That’s not respectful; that’s telling them they don’t matter to us or to Jesus Christ. And that would be very wrong. Does that mean we would stage “interventions” or prevent them from leaving like the inmates of Jonestown, the horrific cult that Jim Jones established in South America in the 1970s? That cult ended in 1978 when, on Jones’ orders, more than 900 people drank cyanide-laced punch. I think even the angriest opponents of Christianity would admit that’s not what following Jesus Christ is all about. What wise Christians do when someone decides to leave is to remain friends with them, pray for them and welcome spiritual conversations. Do you want this life? Yes or no, post your thoughts below and let’s have a conversation. “Beliebers” lack the rite and ceremony that you listed as a requirement. You also failed to note that Dictionary.com specifically lists religious requirements for the label of “cult”. Was that an intentional choice, to make your premise fit? I would argue that Christianity is not a cult simply because cults are known and accepted to be small groups, characterized by greater devotion (Merriam-Webster). That’s why we refer to some films as having a “cult following”. 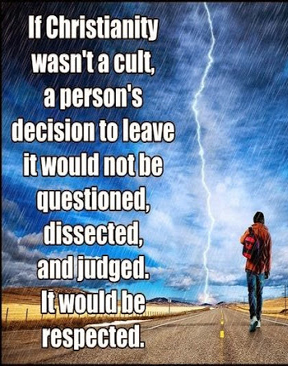 I have a very difficult time seeing the connection you’re trying to make between Christianity being a cult or not and somebody being allowed to walk away from their former faith of their own free will without harassment. It seems like you’re trying to make too many arguments in too short a space against too poor a graphic to be worth responding to. However, as an atheist and former believer, I will at the very least commend you for your final bit of bold format text, which I take to mean you choose to remain civil. That’s all too rare, I’m afraid. 1. I limited the Dictionary.com definition of a cult because the blog was simply too darn loooooong and I had to squeeze somewhere to make it less onerous to read. 2. The connection between Christianity being a cult and somebody being allowed to walk away from it without harassment is not my connection. It’s the connection made by the person who created the meme/graphic and posted it on an atheist Internet community. I’m simply reacting to the connection that person made. I have a brother in Christ who used to attend in COP where i am attending to study the word of GOD but he discontinued as he used to tell me he feels not welcome or blessed in that church. Then I explained to him that following Jesus is not based on the emotions, but a strong decision & desire of our hearts to love Jesus whether we are good/bad/sad/happy. It’s his will to find a congregation where he feels comfortable as he thinks of being blessed. GOD created us with a privilege to choose. About 25 years ago I went through a period of tremendous doubt about the Christian faith. I don’t mean the little doubts that creep into our minds from time to time. I’m talking about facing the fact that Christianity is wrong. If it is wrong, on what would I hang my beliefs? I had basically stopped going to church mostly because of work conflicts, but one week when I attended, an elderly lady expressed her hope that even if I didn’t attend that church I would attend somewhere. At the time it felt nice to hear that. Looking back now, I realize the “freedom” she granted me is the way to treat someone who may consider leaving the faith. If they truly are seeking what is right and true, won’t they find Christ in His right and true form? Too many churches are man’s perversion of what Jesus wants them to be.